This basket was handmade for me. It was one out of a set of 8, that a reader sent in for a product review sample. This particular basket was handcrafted with natural maple & leather straps. 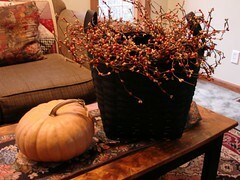 During one of my trips to a favorite gift shop, I saw a beautiful black basket with a berry garland around the top. Unfortunately, it was way out of the price range that I was willing to pay for it. I started thinking about some of the baskets that I had at home, and I decided to try an experiment with one of them. I used a can of flat black spray paint and covered the basket inside & out (outside in a well vented area of course :). At first I wanted to try to keep the handles from getting paint on them for fear of ruining the leather, but then I decided to go ahead & try to paint them. I was pleasantly surprised at how nice this project came out! Both the leather & the wood received the paint, and both covered very well! As you can see in this picture, I’ve added a nice fall berry garland to the top for the season. Each season, I plan to add some different type of decoration. You could use any extra basket that you have around your house – a $1 can of paint & some seasonal decorations to make your own inexpensive decorative display. I really love the way this project gives me a primitive basket look, at a very small price! Soup up Your Soup – Easy touches that make soup great! I love the basket! If you’re like me, catalogs and trips to cute little shops are more “idea gathering” trips than “buying” trips! Wow!!! I LOVE LOVE LOVE it! I’ve found that flat black spray paint is my new best friend. I don’t know why, but all of a sudden, I’m very into black! I found a round kitchen table on the side of the road, brought it home and hubby sanded it and used about 15 can’s of flat black spray paint, (98 cents at Wal Mart), and I distressed it and waxed it with several coats of wax. It’s my favorite piece of furniture!!! Thanks for the kind words Cara! I’m with you – I love black (as you can see from some of the pictures of the inside of my home 🙂 Your table sounds beautiful – I’d love to see a picture of it!